Mia has a very nice set of pictures from our trip over here. Mike meanwhile, has the rants of the trip going on right here. One word about Talipanan and Aninuan: Awesome! The next day, we went back to White Beach to experience the Galera summer. And oh man, did we ever experience it! Galera with 4 pitchers of Mindoro Sling whacks you in the head pretty damn hard, I tell you. 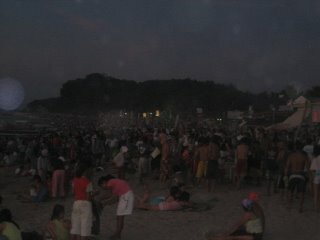 The only thing I didn't like about this trip was that Galera was way too damn crowded. Literally filled to the brim. The next day, we were on our way back to Manila when Joseph called us up and invited us to meet up with him in Makati for lunch and some other things. We obliged of course and met up with him at the Ayala malls, despite still being in our beach clothes. It was his 28th birthday, after all. Haha. Over all, it was a fun, not perfect but great nonetheless, weekend. Now I'm back in Manila, working on weekends in front of my laptop. Life is a balancing act, agree? One thing that perks me up however is that it's finally the start of the rainy season. I love it when it rains. Temperature is moderately cool, and come on admit it, walking on the streets with the slight pouring of rain on your head, sun hiding behind gray clouds, is always fun. At least that's how I feel. The rainy season made a big entrance this year with a pretty mad typhoon (Named Caloy by the local weather bureau.) I love typhoons and the huge amount of rain and nasty wind they bring. The only thing I hate about them is sometimes, they come with a death toll. Oh, and it's Mother's Day today right? Happy Mother's day to my mom (who doesn't read this), and to all the mom's out there (who do read this.) You rawk. you have 28 year old friends?! wow. Uy, daming tao sa galera, parang Baclaran. Hehehe. hey alvin! it's just now that i got the chance to visit your blog! hay naku! kung anu-ano na pala pinagsasabi mo dito! apihin ba ako sa blog mo?! 23 years old pa lang po ako no!! !